Do you dream of visiting a far away, warm destination this winter? Do you crave the warmth of the Bahamas, Mexico, South America, northern Australia or Africa? Even if you can’t get away this winter, let the Milwaukee County Zoo take you on a day trip around the world. The Zoo is your perfect destination for any cold, wintery Milwaukee day. 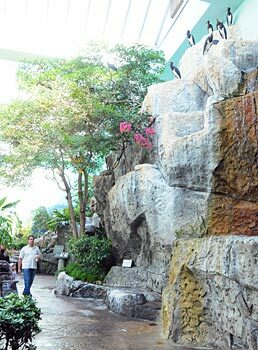 Inside the Herb and Nada Mahler Family Aviary, you’ll feel like you’re on a tropical island. The Stearns Family Apes of Africa and Primates of the World building will transport you to the warm jungles of Africa and South America. Don’t forget about the Aquatic and Reptile Center, the Florence Mila Borchert Big Cat Country building, the Australia building and the Small Mammals building. The Milwaukee County Zoo is open 365 days a year. That means we are open every day, even on holidays! Be sure to check out our daily hours before you arrive. See you at the Zoo this winter!